Blind and super-aggressive, bright orange-red in a huge range of sizes from 2mm up to 8mm+. They can bite like fire and the bigger ones can sting. The males are huge: ‘sausage flies’ up to 25mm long, while the seldom-seen queens are amongst the largest known ants, reaching up to 35mm or more. Illustrations of the males and queens are in progress. The live in very large, restless colonies of many thousands of individuals. The colonies are often nomadic, literally marching under leaf-litter and through the twilight hours from one food source to another. They frequently invade domestic compost heaps and they seem to be able to survive invasives like Argentine ants. 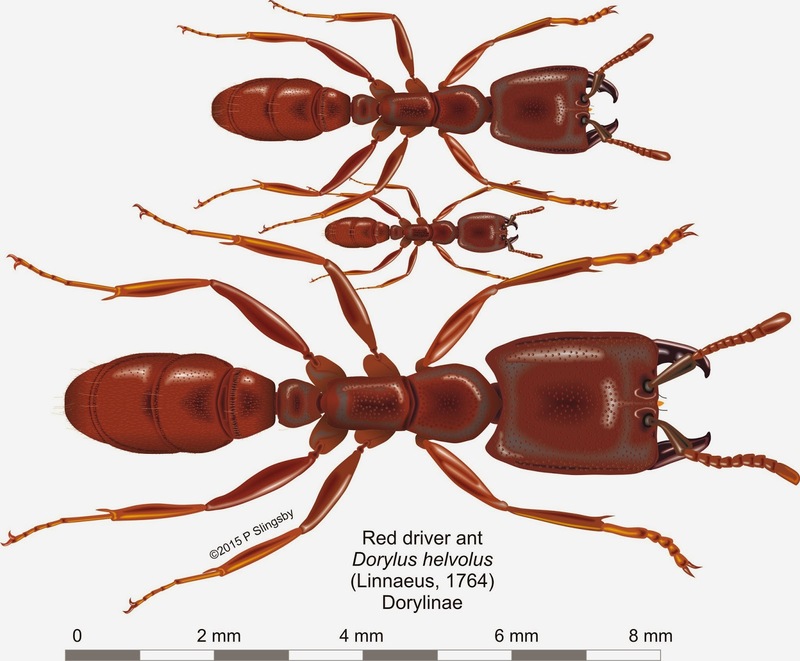 There were thousands of Pheidole fleeing from the advancing columns of Dorylus. 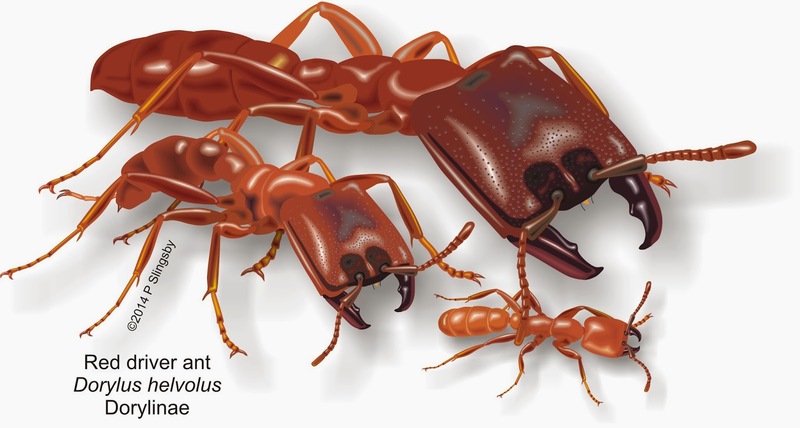 Pheidole seemed more fleet-footed, and I'm sure many survived the attack. However, I think the fate of the Pheidole larvae and pupae was much worse! I could only witness this raid for about twenty minutes, after which the action advanced underneath a thick garden hedge and out of sight. 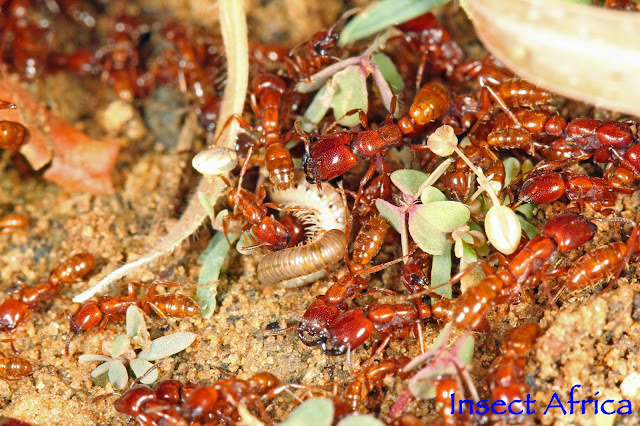 Dorylus are wide-spread throughout sub-Saharan Africa, except for very dry areas. "Soldier or worker maxima - TL 8 mm; castaneous, mandibles and anterior portion of head and apical segments of gaster, darker. Legs very scantily pubescent, funiculus moderately pubescent, a few long hairs on the petiole and abdominal segments. Whole body, except the posterior face of the node and the funiculus, very shining, evenly and distinctly punctured. The punctures are larger and deeper on the head and thorax, shallower and smaller on the petiole and gaster. The petiole is reticulate-punctate on its posterior face, from each puncture arises a pale microscopic hair. Head at least one-quarter longer than it is wide, parallel-sided, slightly narrower behind, posterior angles rounded but very prominent, owing to the deep and almost angular occipital emargination. Mandibles scarcely longer than half the width of the bead, very blunt at the apex, and with a blunt tooth near the middle of the internal margin. Clypeus almost linear, except in the middle, where it is slightly and triangularly extended between the frontal carinae, and produced into a small platform on the anterior margin. The frontal carinae short and narrow, free and raised at the sides into a lobe which ends posteriorly in a sharp spine. Scape of antenna incrassate and flattened towards the apex, about two-thirds as long as the funiculus; the latter 10-jointed, all the joints except the last wider than long. The scape and funiculus together are about three-quarters the length of the head. Pronotum rounded in front, narrower behind than in front. Pro-mesonotal suture well defined; mesonotum and propodeum rather flattened above, declivity of the propodeum vertical and very short. Node of petiole quadrate-globose, slightly wider behind than in front, the ventral lamella produced in a wide angle. First gastral segment narrow at the base, 2nd and 3rd segments sub-equal, and a little longer than the 1st, 4th segment a little shorter than the preceding, 5th segment widely and semicircularly excavated apically, the dorsal boundary of the excavation forming a sharp edge, ending on each side inferiorly in a short tooth. Minor worker - TL 5-6 mm. This differs from the major in the following characters. The colour is slightly lighter, and the head is a little narrower behind than in front, and is only arcuately emarginate behind. The apex of the mandible is not blunt, but ends in two sharp teeth, the lower tooth being the larger; the tooth on the inner margin is also acute. The pubescent hairs on the body are longer. Minima worker - TL 1.7-2 mm. Colour pale dirty yellow. Funiculus 9-jointed. Pilosity and pubescence stronger than in the minor. Mandibles without a tooth on the internal margin, and with the upper apical tooth almost obsolete, making the mandible an elongate triangle. This species has been recorded from the larger part of the South African region. In Zimbabwe it is common, and more frequently met with than any other species of the genus. (S.A.M., R.M., G.A. colls.)"